This species is also known as the golden sea snake. 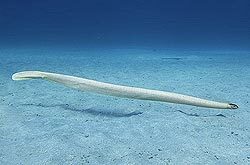 It is found mainly in warm coastal waters in the Indo-Pacific where they live on coral reefs, lagoons and rocky shores to depths of 5 to 45 metres. In Australia they are found in coastal waters off the northern half of Australia from Brisbane in east to Shark Bay in west. 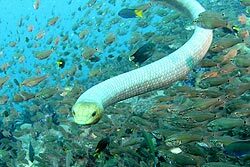 I is the most common sea snake on the reefs of eastern Australia. It has a sturdy body with a flat, paddle-like tail and is purplish brown above with paler brown on the underside. Usually has some creamy white scales scattered over body. They can be aggressive but attacks on divers are rare. Their average length is 1.2m, but they can grow to two metres. Its fangs may be 7 mm long Unlike many other sea snakes it has a wide diet, feeding on fish, fish eggs, cuttlefish, prawns, crabs and molluscs. They squeeze their prey and inject their venom. When not foraging (at day or night) or surfacing to breathe, snakes hide under any convenient cover rather than returning repeatedly to the same shelter. They can stay underwater for almost 30 minutes. Males become sexually mature at about 3 years of age while females mature at 4 to 5 years. The larger females produce eggs in the southern spring (October). The embryos develop for about 6 months and young are born in the southern autumn (April). Individual females probably breed only every other year. They give birth in the sea to 2-5 live young with an average brood of 2.6 young. 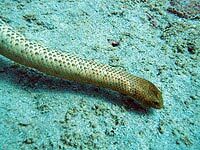 Olive sea snakes live to about 15 years or more. The Brown Lined sea snake, is a very special Western Australian Endemic, mainly known from coastal waters. creamy white with a brown ridge down the back.